These days I seem to have a knack of encountering the more difficult to photograph birds in seemingly easy situations. 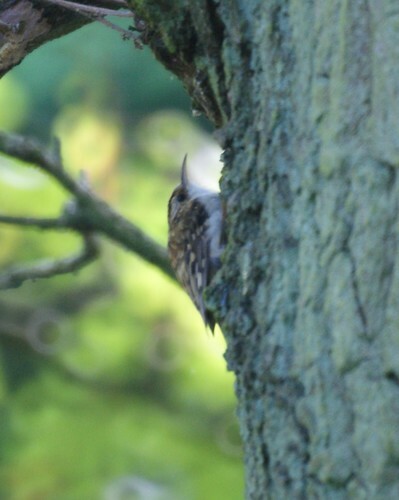 About a month back, I`d struggled to get a blurred image of a Treecreeper and I was told that its a really hard bird to catch. On this occasion however, I got more than lucky. While waiting around to snap the Kingfisher, I suddenly noticed something hopping about on a nearby tree. My camera was ready and I fired off a few rounds. 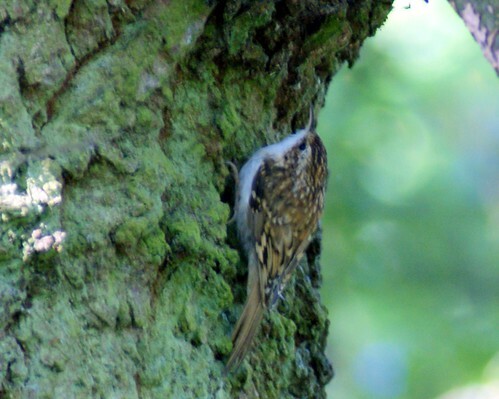 I realised it was a lone Treecreeper! i moved in closer but found that the sun was coming from in front at an od angle making it really hard to focus on the bird. The bird moved behind the tree and I followed it. Suddenly it just sat absolutely still as if playing dead. The camouflage was perfect, if I didn’t know it was there, I`d have missed it completely. In fact I had to double check if i was actually trying to focus on a bird or a bump on the tree. As it didnt seem to be in any hurry, I took a risk and swapped the 500mm reflex lens for the 300mm Minolta lens, allowing me to get a really good image. note the glint in its eyes as the flash fires. As for why it actually sat still the whole while, I think it is just habit. 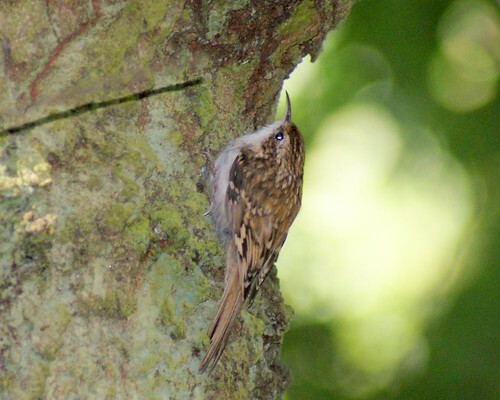 The treecreepers are known to roost in the cavities of tree bark, usually several of them on a single tree. 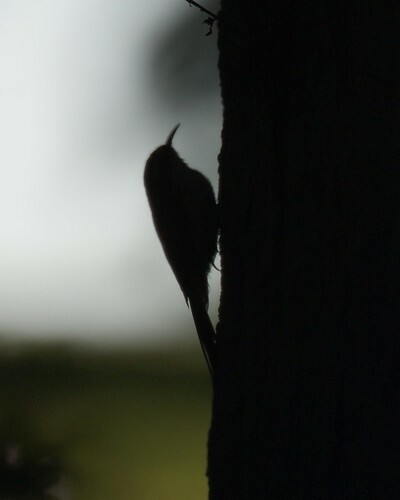 its favoured spot is usually beneath the first branch of a tree. 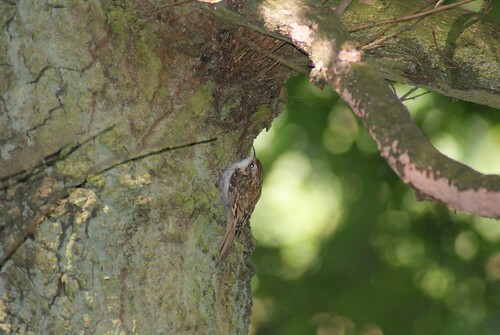 My bird had located itself beneath the first branch too, however it was still mid day so it probably wasn’t roosting. I guess it may have just stopped over for a mid day snooze. That probably answers where birds disappears around midday! Good shots of a small passerine. I love the silhouette in the first shot. 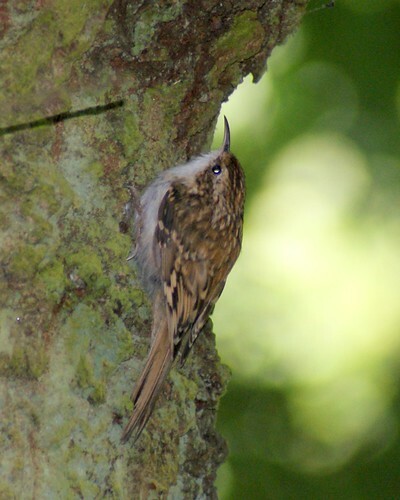 It is very similar to our Brown Creeper. Also notoriously hard to see let alone photograph.